A lot has happened since I reviewed the first Masai Mara shotgun that was ever imported into the United States last summer. Masai Mara shotguns have a five year warranty and Briley handles any warranty work that might be required. Five chokes are supplied with every Masai Mara shotgun. However, George Trulock is working on adding Masai Mara chokes to his extensive line-up, something that will please Masai Mara owners. Retay USA has been established, the website is https://retayusa.com/ . Chris Handy is the owner and proprietor of Retay USA and, as the importer of Retay Arms shotguns, has already set up dealers with more to come. There are two basic models of the Masai Mara 3 inch chambered inertia shotgun: walnut and synthetic, with dozens of variations. The Masai Mara is presented as a luxury grade shotgun, not just another Bruno Civolani action clone. By now, I've tested and reviewed over fifty different inertia shotguns, and many of them offer little or no features of practical value. The Masai Mara is quite a bit different in that regard, as it does several things better than a regular inertia or “kinetic action” shotgun. Over the last few years, Retay Arms has been working at eliminating the “Benelli Click” that has frustrated some inertia shotgun owners since the 1960s. It is the RetaY “Inertia Plus” action that eliminates the out-of-battery problem associated with inertia guns. For 2018, all Masai Mara models entering the United States will have the “Inertia Plus Action” with no up-charge in price. The best looking Masai Mara shotguns, in my opinion, are the oiled walnut and polished blue barrel models. My favorites are the Cerakote receivered GreyCon, the Bronze Pure, and this Satin ST model. Some of the catalog images of the Satin model didn't look that good to me, showing the receiver as having a greenish yellow color. I'm glad to say that in person, that isn't the case at all . . . the Satin is one eye-catching shotgun. You'll like the price on these models as well. 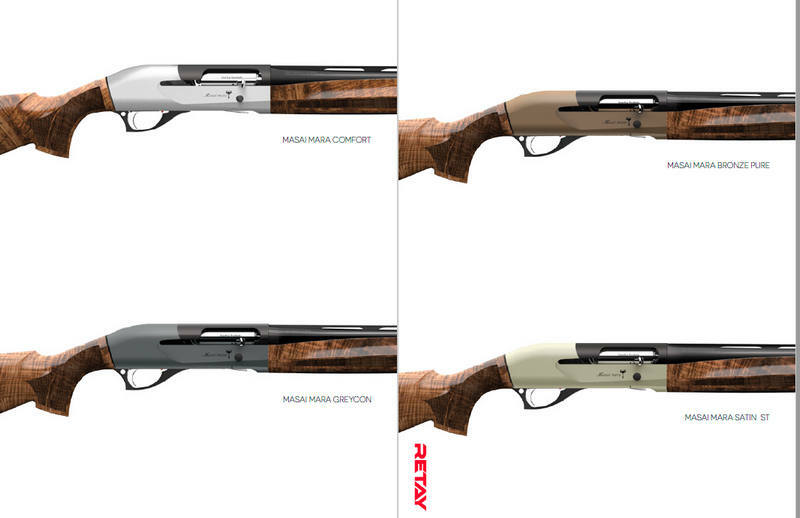 They might look like $2000 shotguns, but the MSRP is $1095 with street prices well under a thousand dollars. The synthetic Masai Mara models are less, starting at $799 MSRP. The oiled walnut, polished blue, Cerakote receiver models are the best-looking autoloading shotguns I've seen at under a thousand dollars, and that's saying something. If you want a great looking shotgun with high grade walnut, but don't care to invest any more than a thousand dollars, the Masai Mara is going to quickly make your short list. I carped a bit about the excessively large front bead on the first Masai Mara I had the chance to shoot: that has been fixed, with a smaller, more appropriate front bead. This Satin model has a 28 inch barrel, and weighs 6 lbs., 14 ounces: about two ounces more than the 26 inch walnut previously tested. The walnut stock is quite well done, with distinct mineral streaks and not only is it oil finished, but there is enough oil in the stock so the pores in the wood are well sealed, as opposed to some walnut stocks out there that are quite dry out of the box and really need extra coats of oil before use. The trigger is heavier than I'd like, breaking at about 6 lbs. or so. The push-bottom quick release alloy trigger guard is nicely done and a nice upgrade from the pervasive fantastic plastic with visible mold lines that is all too common. I do wish that the cross-bolt safety was a bit larger for use with gloved hands. The charging handle is already nicely over-sized as is the bolt release. Although I've seen the new Retay “Inertia Plus” bolt, I won't have one here for a week or two. As soon as I receive it (it is a drop-in) I'll continue with part two of this review, comparing both bolt types. There isn't much out there that compares with this Masai Mara. The closest thing in a 3 inch inertia gun would likely be the Benelli Ethos, that retails for almost twice the price, usually has a lesser grade of wood (mine did), and also has a plastic trigger guard, a plastic “carbon fiber” rib, and lacks the tougher Cerakote finish of the Masai Mara receiver. My Ethos had a trigger that was even heavier than this Masai Mara example, breaking at 6-1/4 lbs. or so. Maybe that's why Benelli engineers were at the Retay booth at the SHOT Show, to try to figure out how they got outsmarted? For the price, under a thousand dollars as set by the individual dealer, the Masai Mara is in the category of “affordable luxury” that most American upland hunters will readily appreciate. Feel free to e-mail Chris Handy at chris@retayusa.com for more information, or to get yours today.